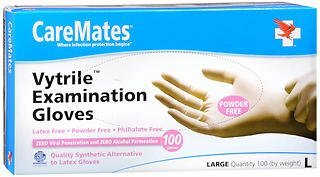 Quality synthetic alternative to latex gloves. Meets ASTM standards for viral, bacterial and alcohol penetration tests. Latex, powder and phthalate free. Stronger than vinyl gloves. Excellent stretch, elasticity and fit. Meets ASTM vinyl glove standards. Non-sterile. Single use only. If you have any questions about this product by CareMates, contact us by completing and submitting the form below. If you are looking for a specif part number, please include it with your message.